O. K., you’ve seen the DVD of the Discovery Channel program on the Jesus family tomb found at Talpiot. Perhaps you’ve even read the book The Jesus Family Tomb co-authored by Simon Jacobovici and Charles Pellegrino. But, you’ve done a Google Search and found out that almost no one else likes the idea that the Talpiot tomb — with references to Jesus, Joseph, Mary, Mariamne, Matthew, and Jose — is indeed the tomb of the Jesus, the presumed founder and Messiah of the world’s largest religion. Despite all the negative verbiage thrown in the general direction of this thesis, no one has come up with a really plausible reason for rejecting it out of hand. There are two basic counter-arguments by which opponents have attempted to blow the theory out of the water: “the Bible tells me so” (dogmatism, in various degrees of sophistication) and “the names were common” (true, but ignores the problem of the cluster of names). Rather than re-hash these arguments (something which has been done very well by James Tabor and others), I want to ask a different question: what are the implications if the Talpiot tomb is the tomb of the historical Jesus? Here’s my take. 1. No One’s Paying Attention! The most alarming implication is that almost no one is taking this thing seriously, including a lot of very intelligent people and scholars who should probably know better. You don’t even have to believe that the Talpiot tomb is the tomb of Jesus to see the problem here; all that is required is that you see that the existence of the Talpiot tomb raises some basic questions which at the very least require further investigation. This is due to a psychological reaction which I would describe as “shouting down.” If someone were speaking at a public gathering and in response to someone’s fairly specific points, there emerged from the audience cries of “that’s ridiculous!” and “who let them in here?” — we would immediately recognize this as an attempt to “shout down” and shut out the speaker from being heard, or their views from being considered. It is a bit more difficult to see if it happens on the internet, or in the media, but the basic phenomenon is the same. Several anti-tomb bloggers express what these scholars probably are feeling but don’t say in public: “I find it a shamful [sic] waste of time giving the movie or it’s [sic] context so much attention,” “My concerns with giving a serious response to the ‘Jesus’ Family Tomb’ matter is [sic], firstly, that I feel it lends legitimacy to something that is totally absurd,” etc. This is, in my opinion, what is happening with respect to the discussion of the Jesus family tomb. This failure to examine the views of your opponents and the issues before you, sometimes issues which are fairly obvious, is alarming because I see it in a wide variety of other disciplines; it’s not just a peculiarity of Jesus scholarship, but a general problem in society. For example, it extends to petroleum geology and the animal rights community. Is this how we are going to debate things from now on? What happened to compassion for your opponents, reason, debate, and things like that? Failure to see the obvious is, I am afraid, another sign of the coming collapse of civilization. The next most important implication of the Jesus family tomb is that it confirms a number of things that we already know, or should have known. For one thing, there really was a historical Jesus, contrary to the “can’t-prove-me-wrong” approach of some popular writers who have postulated a Jesus myth with no historical Jesus at all. More importantly, it also confirms that the family of Jesus held Jesus in high regard, and in fact was probably the core of his movement. This points towards the Jewish Christian Ebionites as the true successors of the primitive Christian community, since they claimed — apparently without dispute in ancient times — to have the relatives of Jesus among their own number. The most startling implication for traditional Christian doctrine is that it completely overturns the traditional Christian view of the physical resurrection of Jesus. While this will be “not news” to a lot of liberal Christian scholars, who have suspected something like this for a long time, it is big news indeed to most traditional Christians. Paul and the Ebionites had a view of a spiritual resurrection: Jesus still lives, but not in a physical body, rather as some sort of angelic presence. But the later church viewed this as a heresy, insisting that Jesus’ resurrection was physical. “Doubting Thomas” is invited to inspect the nail holes in Jesus’ hands (John 20:27); Jesus says to the amazed disciples, “a spirit does not have flesh and bones as you see that I have” (Luke 24:40). As I recall, in the Discovery Channel show on the Jesus tomb, John Crossan is quoted as saying that the discovery of a tomb of Jesus would not be a challenge to Christian faith (presumably, since he is Catholic, to the idea of a physical resurrection of Jesus). There is a sense in which Crossan is right. 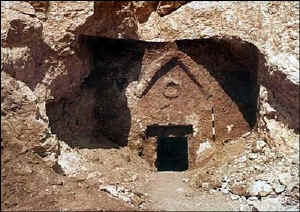 There is no logical reason why a physical tomb for Jesus could not co-exist with the idea of a physical resurrection. Jesus could have acquired an entirely new body created from scratch, and it would be logically possible for Jesus (in his new body) to see his own former body laying dead on the ground. Why should we limit what God can or can’t do? The problem is not the implications for faith (abstractly considered) but the implications for history. This scenario of a new body alongside the old dead one is not how the early church framed this issue. The empty tomb signaled the resurrection: “He has risen, he is not here; see the place where they laid him” (Mark 16:6 and parallels). The whole point of Pilate guarding the tomb (Matthew 27:64) was so that the disciples would not steal the body away and claim that Jesus had risen from the dead. The presence of a dead body, that is, would have demonstrated to them that Jesus was not physically resurrected. Somehow, the idea arose that if Jesus was resurrected physically, then it would be using the material from his old body. A tomb for Jesus, with bones enclosed, lovingly cared for by his family, supports the idea that historically the first followers of Jesus did not believe in or accept this idea of a physical resurrection, as expressed in the gospels. It shows that Paul and the Ebionites (at each other’s throats, figuratively speaking, on some other issues, but in agreement here) had a better understanding of the experience of the resurrection by Jesus’ first followers, than did the orthodox church. While not as disturbing for traditional Christian doctrine, the most startling implication for modern sensibilities is that Jesus and Mariamne (presumably the woman known as “Mary Magdalene” in the New Testament) were married and had a son, Jehuda, who was buried in the tomb as well. This shatters the traditional view of Jesus as celibate, elevates the status of Mariamne, and forces us to re-examine other references to Mariamne or Mary Magdalene in ancient gospels. Here is an example of the problems — and this is a rough sketch, not a precise catalog. Let’s look at the pseudo-Clementine literature, by scholarly consensus of Jewish Christian origin. Among a whole lot of material, there are the following “odd” views, which are not found in mainstream Christianity. (A) The resurrection is viewed as a spiritual one, not a physical one. (Recognitions 3.28, 3.30). (B) The Homilies, especially, postulate a world in which, in effect, evil does not exist. (Homilies 19.20; the Homilies are a bit contradictory on this point, but the drift is clear.) The devil and demons do not act contrary to God’s law, but act in a sense as God’s dark agents. Peter hints, though he does not make it explicit, that even the devil himself may be saved. (C) Homilies 19.14 even has Peter debating the idea that matter is eternal. Turn now to the Gospel of Mary [Mariamne]. What do we find? Spiritual resurrection, questions as to whether matter is eternal, and a theology in which in effect, evil does not exist. So what gives? How did we get from the Recognitions and Homilies to the Gospel of Mary? Most scholars have viewed these beliefs and concerns as part of a “gnostic” world-view, and thought of gnosticism as opposed to Jewish Christianity. Hans-Joachim Schoeps knew about these “gnostic” views in the Homilies but thought of them as anomalous, perhaps the product of later syncretism. In fact, I tended towards this position myself in The Lost Religion of Jesus. But I have to say that I am now reconsidering this position. The problem is that the “gnostics” such as Marcion and the Jewish Christians were opposed. We know this given the vehemence of the debates between Peter (representing the Ebionites) and Simon Magus (representing a “gnostic” viewpoint similar to Marcion’s) in the Recognitions and Homilies. But then, why do the Jewish Christians sometimes take “gnostic” positions? Is it because gnostic editors got hold of the Homilies, or because the Jewish Christians were really gnostic themselves after all, or what? I think that I (and others) may have misunderstood what gnosticism was in the first place. Karen King’s book What is Gnosticism? is helpful in this regard. The phenomenon often known as “gnosticism,” in my revised view, would not be the viewpoint of the second-century thinkers Marcion and Valentinus, but would be a “primitive gnosticism” that would be, essentially, the common ground between Paul, the Ebionites, and the Mandaeans. That would take us back to — let’s see — John the Baptist! We would then view the angry disputes between “Peter” and “Simon Magus” in the pseudo-Clementine literature as a sort of “family dispute” or “civil war” among followers of John the Baptist. The Recognitions and Homilies present the gnostic Simon Magus as a follower of John the Baptist or Dositheus, one of John’s disciples. Maybe he was — and maybe that means that Jesus (who after all was baptized by John) and “gnosticism” aren’t as widely separated as we thought, that indeed Peter and Simon Magus are fighting over the same tradition. I don’t know how much we can make of this. Ancient writers and speakers probably didn’t always act with quite the precision that we expect of them. They did not, that is, propound theory A which modified ideas B, C, and D, influenced by predecessors E and F but in opposition to G. Rather, they just said a bunch of things which sounded good at the time. BUT, even after considering this, it appears that there is more of so-called “gnosticism” in both Jewish Christianity, and among the early followers of John the Baptist (both Christian and non-Christian), than we may have previously thought. By “gnosticism” I mean the non-dualistic kind of stuff found in the Gospel of Thomas, the Gospel of Mary, and other material in the Nag Hammadi library. Paul and Marcion may have taken this ur-gnosticism in one direction, Jesus and the Ebionites in another. The relationship of Jewish Christianity to “gnosticism” is something I was already re-evaluating before hearing about the Jesus tomb; but the presence of Mariamne in the Jesus tomb has prompted me to examine this in even more depth. The Jesus tomb may force us to look at the gospels and traditions surrounding Mariamne in conjunction with what else we know about Jewish Christianity. It is therefore, an urgent and very interesting archeological task to investigate the whole Talpiot tomb further. 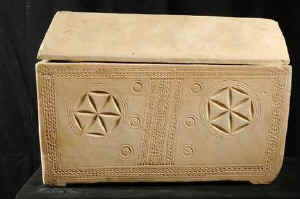 I’d like to see someone address the question, does the “James son of Joseph” ossuary also belong to the Talpiot tomb, as the patina evidence indicates? If so, while I await the word of statisticians on this, it would seem intuitively to me that the case for identifying this tomb with that of Jesus would become very strong, if not overwhelming. Update December 11, 2007: It now turns out that Professor James Charlesworth of Princeton has put together a large academic conference that will discuss both the Talpiot tomb and the James ossuary, in a proper scholarly context, this January 2008 in Jerusalem. It appears, therefore, that the Jesus family tomb is being taken seriously by at least some in the academic community. Not everyone has gotten the message, as James Tabor’s blog shows, but it is now getting at least some attention. This entry was posted in Ebionites, Historical Jesus, Religion and spirituality on September 20, 2007 by Keith Akers.